Unitrans: Unitrans is an iMessage-only app that translates your words, using a variety of language options, so you can send intelligible messages in a language that's foreign to you. It's a free download, but after you try it, the $1.99 In-App Purchase is a must. With the IAP the app will remember the default language for each conversation so you only have to select it once. Without the IAP, you'll have to manually set the correct language every time you use Unitrans, which is a terrible experience because the interface for selecting a language is painfully slow. Depending on the language you need, you have to tap the down arrow countless times to find it. The IAP limits that experience to the first time you message someone new with Unitrans, so I highly recommend it. Once you get the app set up, it is remarkably simple to use, and makes a perfect fit for iMessage. Starbucks: Although some food and drink-focused iMessage apps allow you to place a group order from within Messages, Starbucks went a simpler route. The one function of the app is sending digital Starbucks gift cards to friends – a task accomplished with ease using Apple Pay. 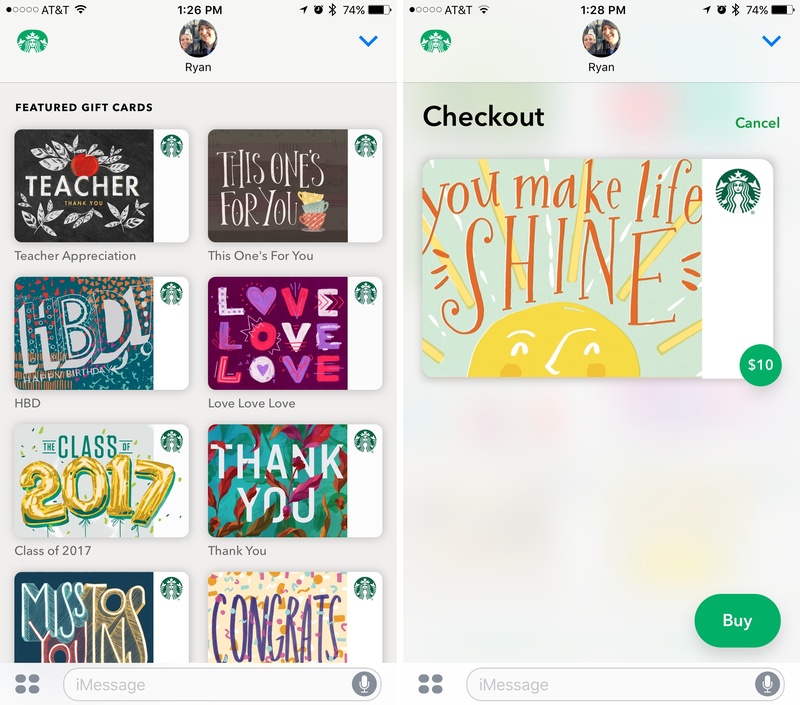 Opening the app presents a number of gift card design options, with themes related to birthdays, congratulations, graduations, and more. Tap on the design you'd like to send, and you can choose from three amount options: $5, $10, and $25. Next you just have to hit a 'Buy' button, scan your fingerprint to authorize Apple Pay, and the gift is ready to send away. Starbucks has really nailed the presentation and ease of use here, making this app a great option when you want to surprise someone with a gift. 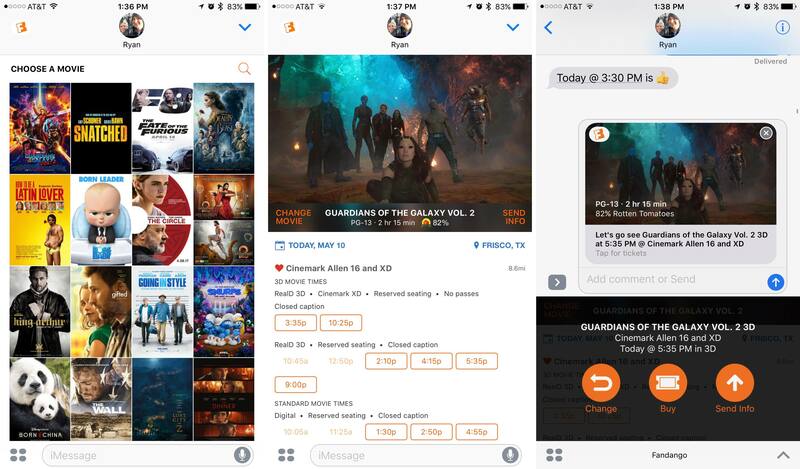 Fandango: Fandango has packed the full ticket-purchasing experience into its iMessage app, and it works quite well. Upon opening the app, you're greeted with an assortment of movie posters that represent the top films currently showing in your area. If you don't see what you're looking for, there's a search option as well. With a movie selected, you'll see all of its showings at theaters nearby, and after selecting a showtime you're presented with two options: Buy or Send Info. The former walks you through the remainder of the purchasing process, including things like seat selection if your theater has reserved seats. Everything can be completed directly from Messages, then those tickets can be sent to your friends. If you're not ready to buy yet, you can hit Send Info to create a rich media card that can be sent to your friends. This card includes imagery from the film, the rating, running length, Rotten Tomatoes score, and the details of the showing you selected. The recipient, upon tapping this card, can hit the 'Let's Go' button or suggest a different showtime. 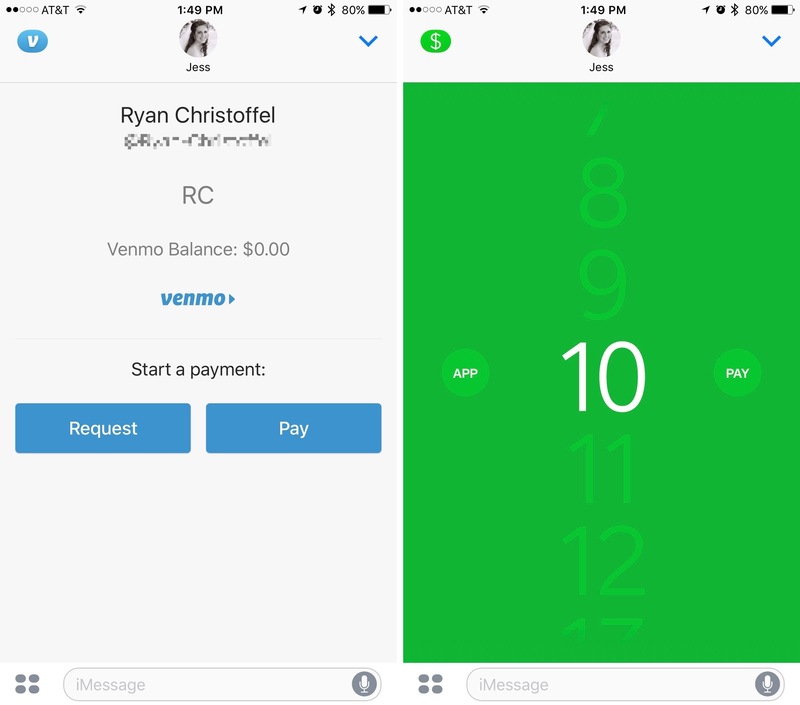 Venmo and Square Cash: Each of these services for sending and receiving money is built around simplicity; once you have an account setup, using Venmo or Square Cash is quick and easy. It makes sense, then, that each service would work well in iMessage. Venmo has the edge, as its iMessage app allows both sending and requesting payment, whereas Square Cash only permits the former. Rumors indicate that Apple is working on a peer-to-peer payment expansion of Apple Pay, which may prove an even simpler alternative to these options. 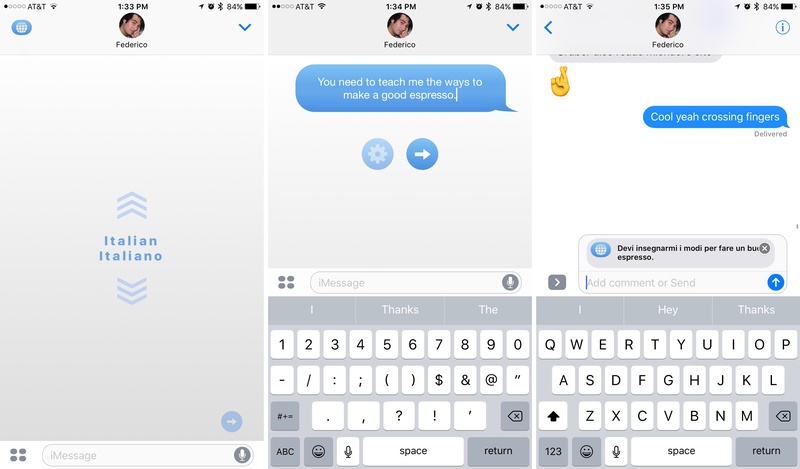 For now though, sending and receiving money doesn't get much easier than these iMessage apps. 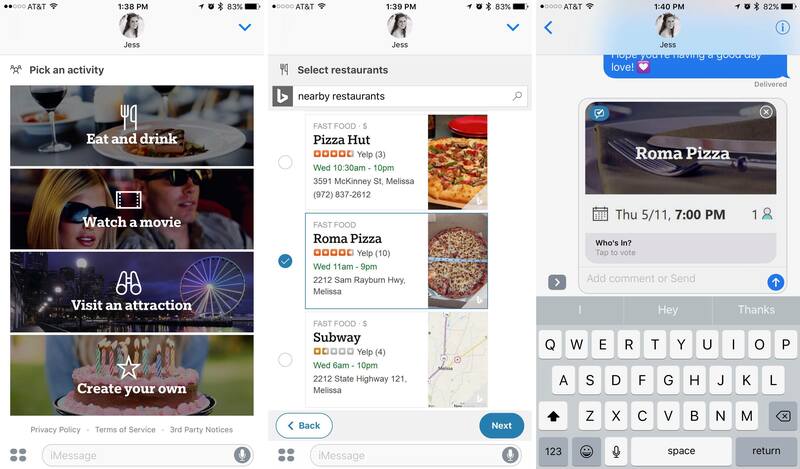 Who's In: Microsoft introduced Who's In last month as an easy way to plan outings with friends. When playing the role of event planner, you can use the app to browse restaurants, movie showtimes, or nearby attractions. Once you've found what you're looking for, making that selection will then prompt you for the date and time of the outing. Those details are sent to your friends in a rich card interface that looks great. When they receive your message, tapping the card will allow them to vote on if they're in for the plans or not. The ease of responding to a proposed event makes Who's In a clever, streamlined method of event planning. 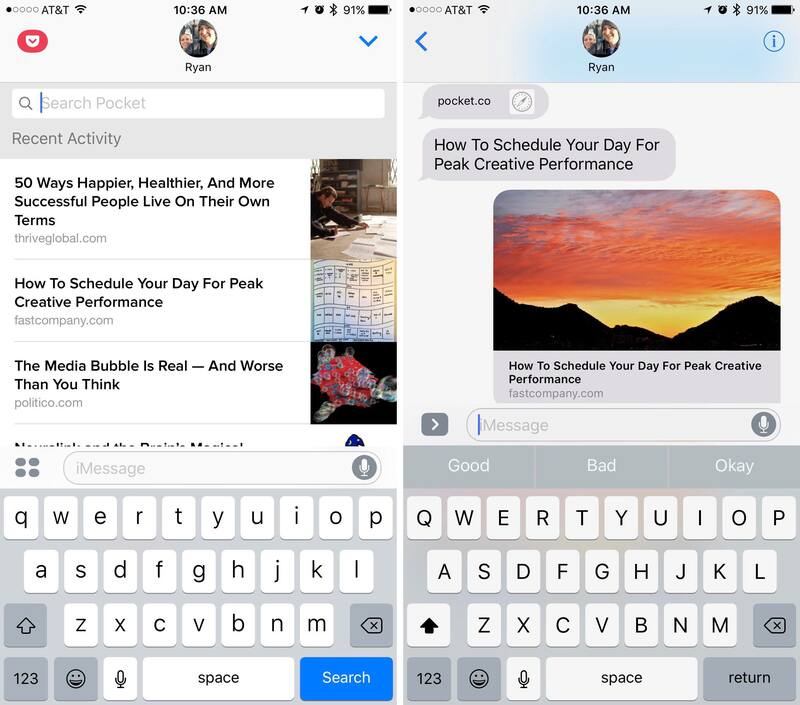 Pocket: Pocket is one of the premier read-later services available today, and its iMessage app is the best way to share articles from the service through Messages. Opening the app will present a list of recent articles saved to My List. If the article you're looking for isn't there, you can use the search box to find articles both from My List and from your Archive. Selecting an article shares its native link containing a featured image, title, and link source. Alternately, if you instead share from the main Pocket app using the share sheet, what you'll share is a Pocket-specific link that results in what you see at the top of the screenshot on the right – a pocket.co link is complemented by a second message bubble containing the page's title in plain text. The iMessage app's output, seen in the bottom half of the same screenshot, is easily the superior presentation. Dropbox and OneDrive: Both of these apps let you share files by browsing your full folder hierarchy within Messages; Dropbox has a slight edge in the field of navigation as it includes a search option, which OneDrive does not. But the way file sharing is handled is fundamentally different between Dropbox and OneDrive. When you send a Dropbox file, what you're really sharing is a file link. This allows recipients to view and download the file in question without needing to do anything extra like download an app. OneDrive opts for a different sharing route; in order to open a sent file, recipients need to have the OneDrive app installed. If they already have the app installed, though, the OneDrive iMessage app will show them a full preview of the file's contents right within Messages. 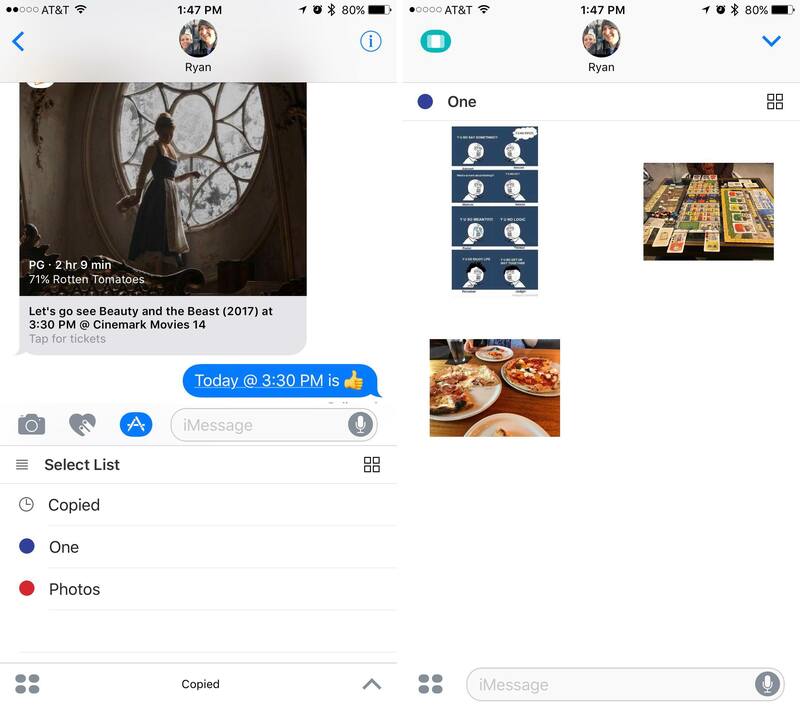 Each approach has benefits and drawbacks – file previewing from within Messages is a nice user experience, and one that Dropbox doesn't have, but that benefit comes with the potential hassle of installing a new app first. 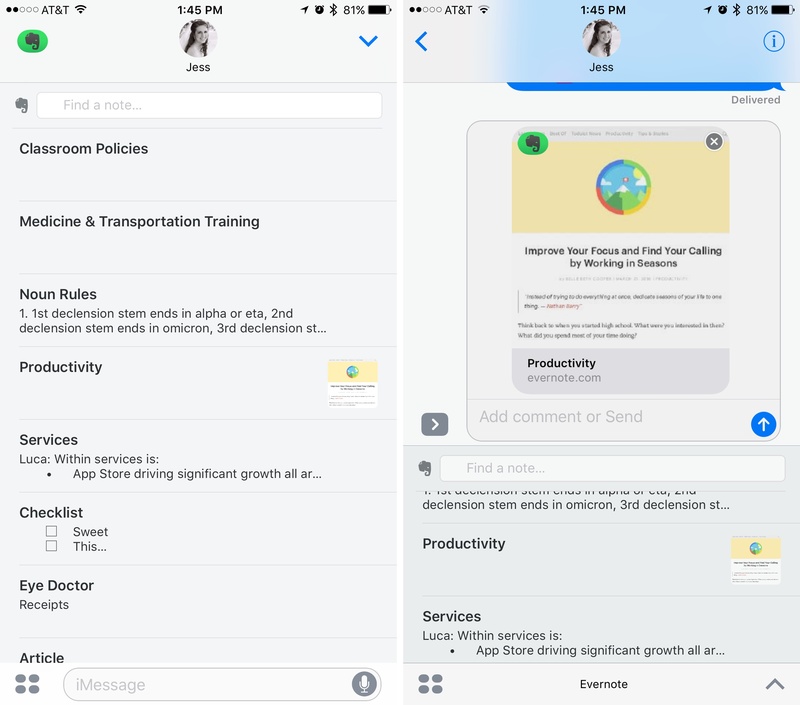 Evernote: Evernote was one of the few productivity apps that launched an iMessage app on iOS 10's release day, and if you use Evernote as your primary note database, you'll likely find a lot to like here. The iMessage app allows you to see recent notes, or search for any other note from your database, and send that note through a message. The nice thing is that all note formatting is retained and presented in an attractive fashion. The one drawback is that for recipients to view a note, they have to download the Evernote app. An account isn't necessary, simply a download; but even still, downloading the app may prove an inconvenience for others. The best use case for Evernote's iMessage app is when you know someone already uses the service, as they'll be able to both view and save any notes you send with ease. Copied: Although Copied is widely considered a productivity app, its iMessage app isn't. It's such a clever app, though, that I wanted to mention it. The iMessage component of Copied won't send text snippets, as you might expect, but instead is used to access your own curated selection of images to send to others. You can set the app up to either display all images that have been saved to Copied in the past, or (my preference) a select group of images that's been organized using the app's Lists feature. 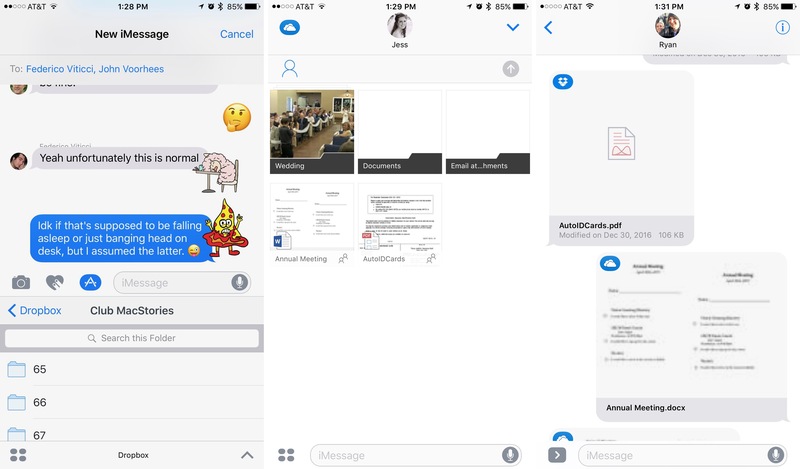 Navigating between different image lists within iMessage is even possible. Essentially, this allows you to create your own "sticker packs" consisting of the images you want, organized the way you want. Developers have done an admirable job building powerful iMessage apps that can make life easier. And while it is still the early days of iMessage productivity, I believe the ceiling of iMessage productivity will ultimately be set by Apple, not developers. Building useful apps is one challenge, but conveniently accessing those apps is another. Much like the iPad's multitasking app picker, the iMessage app drawer interface has been flawed since it launched. Organizing and accessing apps is a slow process if you have more than a handful of apps installed. As a result, iMessage apps are less useful than they should be. It's easier to use Spotlight search to open the full Fandango or Venmo apps than it is to navigate the app drawer in Messages. But that can change in the future. 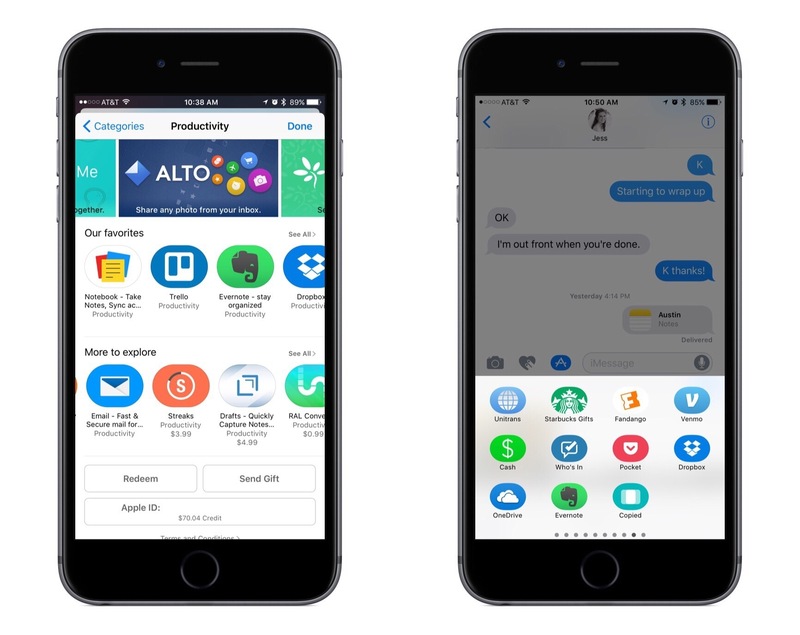 Apple could leverage the iMessage platform as a hub for productivity, the way Slack has built a messaging platform on third-party integrations. Whether the company wants to move that direction remains to be seen; perhaps stickers are the peak of Apple's ambition for iMessage apps. It's quite telling that only two first-party apps feature iMessage support – Music and Activity – and one contains only stickers. The work third-party developers have done shows that potential still exists for iMessage apps to make a meaningful contribution to productivity on iOS. Whether that potential will be realized is entirely up to Apple.